1. Melt the butter in a medium saucepan over medium heat. Stir in the flour and cook for 1 minute, stirring often. 2. Whisk the milk into the roux, then add the cheese and stir often until the cheese is melted. 3. Stir in the remaining ingredients and continue cooking over medium heat until the soup begins to bubble. 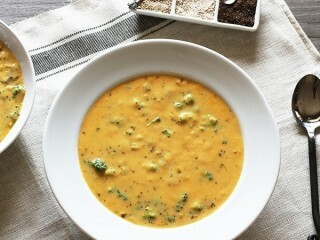 Reduce the heat to low and slowly simmer the soup, stirring often, for 30 minutes, or until the broccoli is tender.